Today has been one of 'those' days. Nothing terrible happened, just a day full of those petty frustrations such as a child who thinks sleep is for wimps and it's okay to watch the CBeebies Christmas Pantomime for the fifteen-hundredth time at 3am; a work laptop that only works when it feels like it; and "women's troubles"
It's also the husband's birthday today. If it was me, I'd love to go out to dinner or have someone cook me something really special. But the husband's tea of choice is a Chinese takeaway and a bottle of Merlot so the recipe had to be a lunch thing. Luckily, I work from home on Thursdays giving me thirty minutes to concoct something for lunch. I actually started this morning's recipe early on. 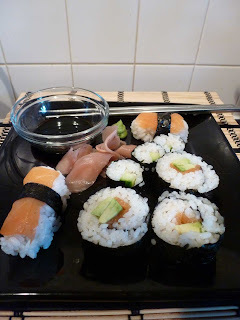 As it's takeaway for tea and I'm still in January-diet-hell, I figured something fresh and healthy would be good so plumped for Sushi, Rachel Allen style. This meant I could make the sushi rice and pop it in the fridge before I started work at 7am and then just had to do a bit of chopping and rolling come lunch time. Now, in a post-sushi making haze, I understand why sushi chefs take seven years to train. I figured it was because of all the different and often dangerous fillings and styles that they use. 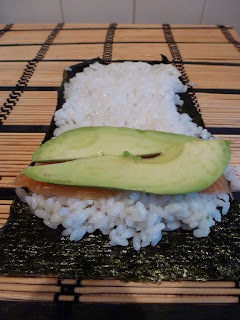 But even the simplest California roll is a challenge to the novice. Firstly, the rice is sticky. So you take a handful out of the bowl and 'gently smooth it over the Nori'. Except that most of it stayed stuck to my hands. A lightbulb moment dawned and I figured that damp hands would be better. Except this caused the rice to lose it's tackiness and then I couldn't shape it into little blocks for Nigri. And when you read up on the subject and it says 'you need a sharp knife', they're not lying. It's not just to cut perfect pieces of fish - it's to cut through the Nori, which I ended up taking a pair of scissors to when I was trying to cut through the very last bit of my California rolls. Twenty minutes later, I had roughly the same amount as you'd get in a £4 box from M&S except they were all the same flavour. Did they taste better and fresher? It wasn't really noticeable as I only had smoked salmon and avocado. I'd love to do fresh salmon and tuna ones, but when I was looking up how to buy sashimi grade fish, it all sounds quite scary if you don't buy quite the right stuff and horribly expensive when you do! Would I make it again? Maybe if I wanted to show off for a get together and had hours to make it. But just for me? Nah, I'll stick to the shop-bought stuff. It may not be as good as the meal I once had at Nobu in another life, but I'm not that rich or pretentious to care. As for Allen's instructions? I don't think it can even be dignified with the term 'recipe' and lunch time is over so I don't have time to type up her waffle for now. She implies that she and her husband 'figured out how to make it between themselves'. So they read the instructions on the back of the sushi packet, looked at how the box they'd bought from Marksies was put together and then became experts? She doesn't even describe the Nigri properly - referring to them as patties, which in my book means round and flat when in fact the picture in the book quite clearly shows them to be block shaped (as they should be). I'm sure there are far better instructions for sushi shaping on YouTube. This is the first recipe I've tried from Food for Friends. I'm not sold on it so will have to make something else from her shortly. I bought the book based on the glossy TV series and imagined myself wandering around barefoot on a flagstoned kitchen floor in a big old country kitchen, cooking delumptious things for friends and family a few years from the date of purchase. Instead I'm stuck on the edge of the 'burbs in a newish-build semi with a slight tang of disappointment from the book I thought would change my life. Oh well, it only cost a tenner. And on the health front, the small amount of sushi I made actually contained more calories than my usual working from home lunch of two slices of wholemeal toast with peanut butter. I know which I'd prefer next time!